If you played Rust prior to July of 2016 (before XP was introduced), you likely already have a solid grasp on the basics of this new progression. A hybrid of the components and blueprints , Blueprints 3.0 brings back the concept of learning a blueprint before being able to make the item. 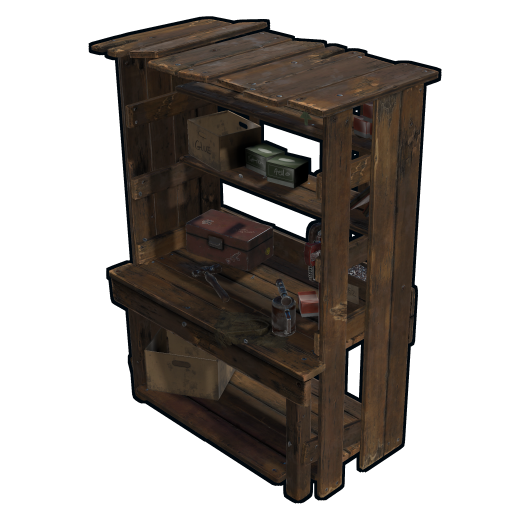 Additionally, it introduces several tiers of workbenches, requiring you be in front of a certain workbench to start the craft particular items. Check out our components guide to learn how components and blueprints work together. Do I need blueprints to craft any item in the game? What about wipes? Do blueprints wipe when a server map wipes? Blueprints generally don’t wipe every time the map wipes, so it is advantageous of players to stick to servers which they’ve already learned blueprints on. Although server owners can choose to wipe blueprints at any time, Facepunch generally doesn't force a blueprint wipe unless a change to the game dictates a fresh start. On Rustafied servers, we plan on wiping blueprints bi-monthly or when forced by Facepunch. There are several ways to obtain blueprints. By default, low tier blueprints can be found in barrels, however most other blueprints must be learnt by first having the actual item. Once you have an item you want to be able to craft, you must use a research bench and place the item, along with the corresponding amount of scrap to learn it. This will remove the item you have placed in the research bench to learn, but you will be able to use components to now craft it at a suitable level workbench. An alternative to obtain a blueprint is to use the workbench experimentation feature. 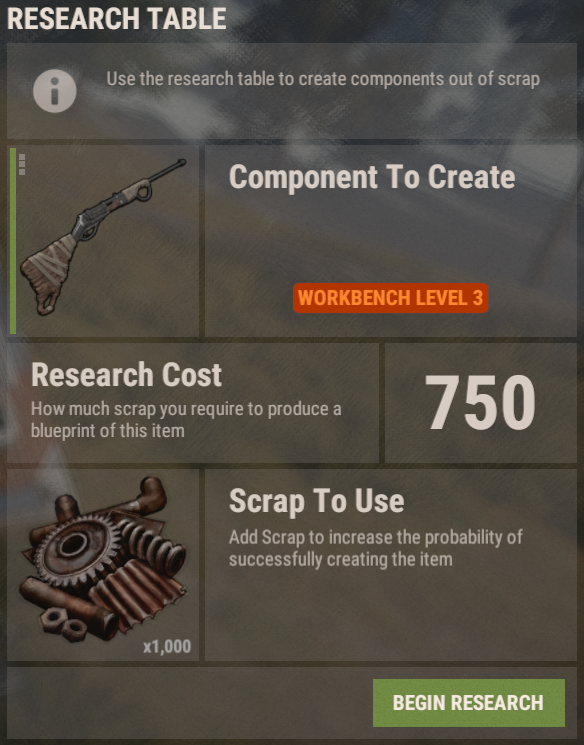 For each tier workbench (1, 2 or 3), an amount of scrap can be traded for a random same-tier blueprint. For example, placing 75 scrap in a workbench tier 1 will give you a random blueprint from the tier 1 items, such as a metal hatchet, or revolver. Tier 2 will cost 300 scrap for a tier 2 random blueprint etc. If you played Rust back during the old blueprint system, you’d use BP Fragments along with an item to gain a certain percent chance of generating a blueprint. This new scrap system, although similar, is not a game of chance like the researching of old - a specific amount of scrap will definitely yield you a blueprint as well as indicate the required level of workbench to craft it. What is a work bench? Gone since the days of legacy Rust, the workbench is back! 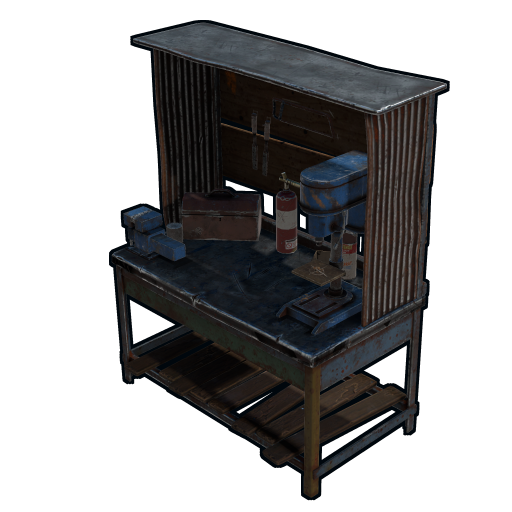 Workbenches are required for crafting most items in the game, they have three tiers, item descriptions will tell you which tier you need in order to craft. Unlike legacy Rust, you do not slow down when you are away from the workbench, you will simply be unable to craft the item. Each tier can also craft anything a lower tier can, so items that require a tier 1 or 2 bench can be crafted with a tier 3 bench. Crafting items at a higher tier than required workbench will also decrease your crafting time by up to 75%. You are able to walk away from a workbench and continue crafting the items that you started, walking away will cancel the craft speed benefit of a higher tier bench though. Scrap is an item that is found in boxes and barrels, it’s also a by-product of recycling most components. 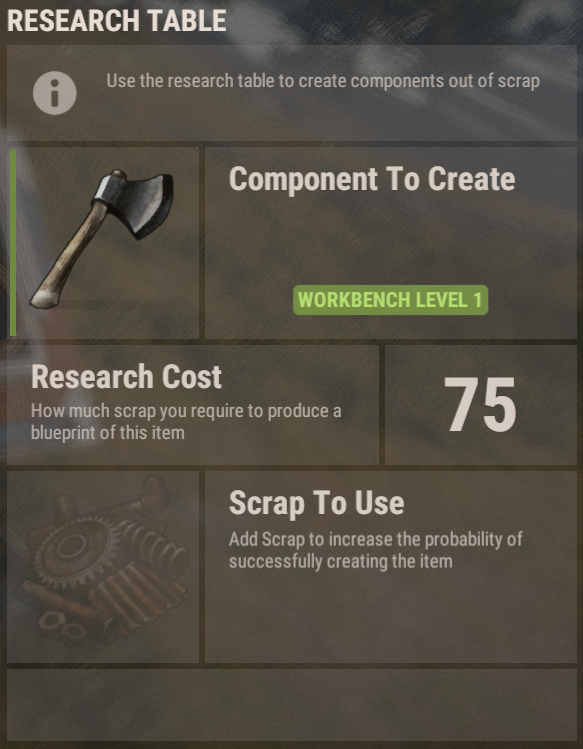 Scrap is a hot commodity in Rust, it’s required in order to learn items at the research table. Scrap requirements increase considerable based on the item you are trying to research. For instance, a Medical Syringe requires 75 scrap to learn, but a high external wall requires 750. For those familiar with the previous blueprint system, this is a small change as scrap works very similarly to blueprint fragments. Scrap is usually found in small amounts aside from higher end loot crates. Scrap is also required to craft components like springs and gears. The developers have opened up entirely new ways to interact with other players. While killing on sight is the norm - most of the time, the ability to bargain with people is now a viable option in some situations. Knowing how to make some items and offering that knowledge to other players that intend to harm you can provide a tool to help you keep your precious loot as well as the possibility to gain a new friend or ally. Wouldn’t this system benefit larger groups and leave the little guys behind? While it is true that larger groups are able to advance faster than smaller groups or solo players simply because of their size, this system also creates new ways for those smaller groups to get ahead. Vending machines selling blueprints in exchange for scrap or resources are popping up all over the map. Each one of these are an opportunity to advance without having to deal with the RNG nature of finding items and scrap in the wild. Many larger groups are selling blueprints in exchange for a large number of resources like wood or sulfur. This is a mostly guaranteed way to get the blueprint you want without having to look around for days in order to find the item drop from a box or barrel. Blueprints can also be learned for minimal effort toward the end of a servers wipe cycle as well. Getting in at the end of the wipe and taking advantage of groups that will open their doors to let people learn is quite common. Symbiotic relationships benefit everyone now, that naked that you might have killed could be a great wood farmer eager to learn how to craft items, and that geared zerg could be your key to learning items quickly. Blueprints help level the playing field if you know how to use the system to your advantage, regardless of numbers. Setting up vending machines near spawn points and monuments generates a great deal of trading with an opportunity for fresh spawns to learn key items quickly by exchanging precious resources. Protecting vending machines is important as they can often house a large number of valuable items. We will continue to update this guide as this system progresses and the devs iron out reliable costs and functionality.